1Department of Laboratory Medicine, Samsung Medical Center, Sungkyunkwan University School of Medicine, Seoul, Korea. 2Department of Pediatrics, Samsung Medical Center, Sungkyunkwan University School of Medicine, Seoul, Korea. Received: September 5, 2016; Revised: February 1, 2017; Accepted: March 13, 2017; Published online: June 22, 2017. Intrachromosomal amplification of chromosome 21 (iAMP21), defined as the presence of three or more RUNX1 signals on one marker chromosome, is a distinct cytogenetic subgroup of childhood B-cell precursor acute lymphoblastic leukemia (BCP-ALL) that is known to have a poor prognosis when treated with standard therapy. The aim of this study was to evaluate the clinical characteristics of Korean children with iAMP21. The cytogenetic data from BCP-ALL children were reviewed. The ETV6/RUNX1 ES Dual Color Probe was used for fluorescence in situ hybridization (FISH). In total, 295 children were included. Of these, 10 patients (3.4%) had iAMP21. The median age of iAMP21 patients was 9 years, and the median value of white blood cell count was 5.09×109/L. Slow early treatment response was observed more in iAMP21 patients. Patients with iAMP21 had a higher incidence of relapse and worse survival rates. In patients with iAMP21, the estimated 10-year cumulative incidence of relapse was 53.3%. The estimated 10-year event-free survival and overall survival rate were 46.7% and 64.8%, respectively. Most cases of leukemic relapse developed in the late period (median, 43 mo). In multivariate analysis, high risk group was the only factor that had a significant impact on death. The existence of iAMP21 was related to delayed treatment response and was likely to affect increased relapse and death in the late period. Further studies are needed to reveal its effect on BCP-ALL treatment outcomes and its role as an independent prognostic factor. Intrachromosomal amplification of chromosome 21 (iAMP21) was first reported in 2003 . It was detected during routine screening for the presence of the ETV6-RUNX1 fusion by fluorescence in situ hybridization (FISH) . Multiple signals were seen in tandem duplication along the abnormal chromosome 21 in metaphase and clustered together in interphase. Currently, iAMP21 is defined as the presence of three or more RUNX1 signals on one marker chromosome or a total of five or more RUNX1 signals per cell . It accounts for approximately 2% of pediatric B-cell precursor acute lymphoblastic leukemias (BCP-ALL) . Features of pediatric B-ALL patients with iAMP21 include older age at diagnosis (median age of 9–11 yrs) and the presence of pancytopenia or mild leukocytosis. Studies suggest that iAMP21 should be considered as a distinct cytogenetic subgroup of childhood BCP-ALL due to its poor prognosis. Relapse rate is increased 3-fold, and overall survival (OS) rate is 71% on treatment with standard therapy, which is poor compared to other BCP-ALL patients . The aim of this study was to evaluate the characteristics of Korean BCP-ALL children with iAMP21 and to compare them with previously published studies. The cytogenetic data from 383 children with BCP-ALL who underwent an ETV6/RUNX1 study at the Samsung Medical Center were reviewed. Cytogenetic data included conventional karyotype, and the number of RUNX1 signals were identified by FISH. The detection of the translocation (12;21) by FISH was done prospectively on all newly diagnosed BCP-ALL cases. The cases of iAMP21 were identified based on five or more signals of RUNX1 observed in the interphase nucleus using LSI ETV6/RUNX1 ES Dual Color Probe (Abbott Diagnostics, Maidenhead, UK) for FISH. The probe was used according to the manufacturer's instructions. Briefly, denaturation of probe and slide was performed at 73±1℃ for 5 minutes followed by hybridization overnight at 37℃. Hybridization signals were assessed by using DAPI/FITC/Rhodamine triple-band pass filter sets. Metaphase FISH was also reviewed if available. For the cases meeting the above criteria, white blood cell (WBC) count,risk group at diagnosis, patient demographics, and clinical course were also obtained from medical records. Patients who were over 10 years of age or under 12 months, or who had initial WBC count of 50×109/L or more were considered as the high risk (HR) group at initial diagnosis. Patients with at least one of the characteristics including initial WBC count of ≥200×109/L, positive BCR/ABL rearrangement, hypodiploidy under 45 chromosomes by cytogenetics, or t(4;11) by cytogenetics were considered as the very high-risk (VHR) group. Others were the standard risk (SR) group. Regardless of the risk group at diagnosis, patients who failed to show remission after induction chemotherapy or who experienced disease relapse after remission were reclassified as the VHR group. Patients in the HR or VHR groups received more intensified chemotherapy during induction and consolidation treatment than those in the SR group. Allogeneic stem cell transplantation was performed in patients in the VHR group after induction and consolidation chemotherapy when a suitable donor became available. To assess early treatment response in this study, patients whose bone marrow status was M1 (less than 5% blasts) or M2 (5–20% blasts) at the seventh day of induction therapy (D7) were considered as rapid early treatment responders (RER). Patients with a bone marrow status of M3 (over 20% blasts) at D7 were considered as slow early treatment responders (SER). Patient characteristics and outcomes were compared across groups using the Chi-square and Fisher's exact tests. Continuous variables were compared using the two-sample t-test. The 10-year probabilities of OS and event-free survival (EFS) were estimated using Kaplan-Meier methodology and compared using the log-rank test for univariate comparisons. Leukemic relapse, second malignancy, or death was considered an event in analyzing EFS. To analyze the cumulative incidence of relapse, EFS, or OS, data from patients without a relapse, an event, or death, respectively, were censored at the last follow-up. Multivariate analysis using time-dependent Cox regression analysis of outcomes was performed using variables of iAMP21, the risk group at initial diagnosis, and early treatment response. Results are expressed as hazard ratios that represented the relative risk (RR) of occurrence of the events in the no iAMP21 group compared with the iAMP21 group, the SR group with the HR or VHR groups, and the RERs with the SERs. All statistical analyses were performed using IBM SPSS version 22.0. (SPSS Inc., Armonk, NY, USA). Overall, a total of 295 patients were included in the final analysis. Among eighty-eight of 383 patients excluded from analysis, 49 patients had other diseases, 36 patients did not receive chemotherapy at the Samsung Medical Center, and three patients received chemotherapy according to the adult treatment protocol. Patients' characteristics are shown in Table 1. Ten of the 295 patients had iAMP21 comprising 3.4% of pediatric BCP-ALL and were classified as the iAMP21 group. The remaining 285 patients were classified as the no iAMP21 group. The male and female ratio was approximately 1:1 in the total population and similar in both groups (P=0.405). The median age of patients was older in the iAMP21 group than in the no iAMP21 group, with no significant difference between the groups (P=0.257). Patients showed a similar distribution between SR, HR, and VHR groups at initial diagnosis, and their distribution was not significantly different between the iAMP21 group and the no iAMP21 group (P=0.289). The no iAMP21 group had significantly more RERs (P=0.045). Among eight patients in the iAMP21 group whose bone marrow results at D7 were available, only two patients (25.0%) were RERs. On the other hand, 61.5% in the no iAMP21 group were RERs. Clinical characteristics and cytogenetics of patients with iAMP21 are shown in Table 2. The median value WBC count was 5×109/L at initial diagnosis (range, 1×109/L–8×109/L). Among eight patients whose bone marrow aspirations were performed, only two patients had M1 marrow. Five of the other six patients subsequently underwent bone marrow study on the fourteenth day after remission induction chemotherapy (D14). Four of five patients (80%) showed persistence of >5% marrow blast count at D14. All nine patients whose bone marrow results were available at the end of induction chemotherapy eventually achieved complete remission. The number of RUNX1 signals varied from 5 to 20 in the interphase nucleus (Fig. 1). In metaphase, the signals appeared clustered in tandem. Four of 10 patients showed normal karyotype while three patients exhibited other chromosomal abnormalities such as gain of chromosome X, 14, or hyperdiploidy. Three patients were treated as SR and six patients were treated as HR. Recurrent leukemia developed in five of 10 patients at the median time of 43 months from initial diagnosis (range, 16–96 mo). In addition, three of 10 patients died at the median 77 months from initial diagnosis (range, 59–123 mo). The causes of death were disease progression in two patients and post-transplant complication in the other. Fig. 2 shows the cumulative incidence of relapse according to group. The estimated 10-year cumulative incidence of relapse was 24.1% in the no iAMP21 group and 53.3% in the iAMP21 group. We observed a trend toward a higher cumulative incidence of relapse in the iAMP21 group. However, this did not reach statistical significance (P=0.102) (Fig. 2). EFS and OS are shown in Fig. 3. The estimated 10-year EFS was 71.6% in the no iAMP21 group and 46.7% in the iAMP21 group. The estimated 10-year OS was 81.6% in the no iAMP21 group and 64.8% in the iAMP21 group. The iAMP21 group was likely to show decreased EFS and OS rates although these lacked statistical significance (Fig. 3). Intersections of curves between the two groups were observed at around five years post-diagnosis on cumulative incidence of relapse, EFS, and OS. Results from multivariate analysis using time-dependent Cox regression analysis are shown in Table 3. Risk group at initial diagnosis was the only factor that had a significant impact on death. The hazard ratio of HR or VHR patients compared to SR patients was 5.213 (95% CI, 2.162–12.570; P<0.001) on death, while iAMP21 and early treatment response did not reach statistical significance. No independent factors related to relapse were identified in this analysis. The patients in this study showed similar clinical features, as compared with previous reports on iAMP21. Patients with iAMP21 comprised 3.4% of pediatric BCP-ALL patients in this study, which was concordant with 2% in other studies. Other features of iAMP21 such as the presence of a low WBC count and older age at initial diagnosis were also observed. None of the patients were under three years of age. None of the patients showed a WBC count above 50×109/L. In this study, two of 10 cases (20%) showed replacement of a normal chromosome 21 with an abnormal marker chromosome. Four of 10 patients (40%) showed normal karyotype. iAMP21 patients with normal karyotype varied from 0%  to 43%  in other reports, which could be mainly due to the difference in specimen quality and detection sensitivity of each test. Some findings in this study have not been clearly described in previous reports. There were significantly more SER in the iAMP21 patient group than in the no iAMP21 patient group. Most patients with iAMP21 had a persistent high marrow blast count at D7 and D14 although all patients eventually achieved remission at the end of induction treatment. Interestingly, most relapses occurred at the relatively later period except one, which devoted to substantial decline of the 10-year EFS and OS rates from 5-year in iAMP21 group. On the other hand, a slower decline in survival rates in the no iAMP21 groups was observed between the 5-year and 10-year EFS and OS rates. This resulted in the intersection of relapse and survival curves between groups at this point. Findings including low WBC count at diagnosis, delayed treatment response, and high incidence of late relapse may imply the possibility of indolent and chemo-resistant characteristics of pediatric leukemia with iAMP21, which has not been suggested previously. Currently, overall survival of pediatric ALL is approximately 90%  while that of iAMP21 is approximately 70% when treated with standard therapy. Based on this outcome data, the recommendation is that iAMP21 should be treated as high risk. Moorman et al. . showed that intensive therapy was effective with improvements in 5-year EFS (from 29% to 78%), relapse risk (reduced from 70% to 16%), and OS (from 67% to 89%), in agreement with another study . Although this study did not perform subgroup analysis according to disease risk at diagnosis, leukemic relapse occurred in one of three SR patients in the iAMP21 group. Considering that good EFS exceeded 85% in the SR group, our study carefully suggested the possible relevance of iAMP21 with increased recurrence in SR patients and the necessity of intensified treatment in this population. 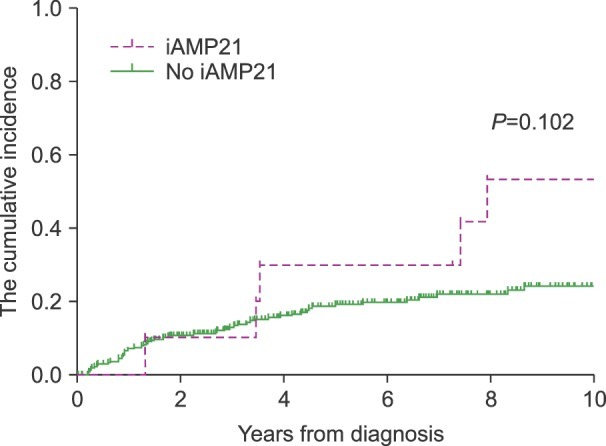 Despite poor initial response to chemotherapy and poor survival rates in the iAMP21 group, analysis using Kaplan-Meier method and time-dependent Cox regression analysis of outcomes failed to show the impact of iAMP21 on relapse or survival as an independent risk factor. First, the limited number of patients with iAMP21 could explain the lack of statistical significance between groups. Only 10 patients with iAMP21 (3.4%) were compared to 285 patients in the no iAMP21 (96.6%). Second, a larger proportion of patients with iAMP21 in this study showed relapse and death at the late time point, unlike the no iAMP21 group. This created the intersections on relapse and survival curves, which might weaken the statistical power and make the interpretation of graphs difficult. The proportion of patients with iAMP21 was small. Hence, studies with a larger population are needed to confirm the effect of iAMP21, with a special focus on delayed treatment response, and relapse or death in the late period. The impact of minimal residual disease (MRD) in iAMP21 patients is still controversial. The Children's Oncology Group (COG) suggested that MRD may not be relevant to prognosis in this subgroup , whereas the Berlin-Frankfurt-Munster (BFM) group reported that MRD-positive iAMP21 patients have an inferior outcome, as compared with MRD-negative patients . Thus, COG and UK studies concur that iAMP21 patients should be treated as high-risk irrespective of MRD whereas, BFM recommends that not all iAMP21 patients should be treated as high-risk because patients with low-risk MRD have a moderate relapse risk on current therapy . We were unable to evaluate the impact of MRD in our patients because MRD was not routinely performed at the time of diagnosis. However, the majority of the studies indicate that intensive treatment of iAMP21 patients provides a significant improvement in their outcome. In conclusion, the existence of iAMP21 might be related to the delayed response of chemotherapy, and increased recurrence and death, especially in the late period; however, this was not conclusive due to the small number of cases with iAMP21 in this study. Considering the benefit of intensified treatment for BCP-ALL reported in previous studies, further detection of iAMP21 in a larger population is essential to provide information about the best treatment option. Reverse transcription-polymerase chain reaction (RT-PCR) or conventional karyotyping has some limitations in detecting iAMP21. Hence, a FISH study using the RUNX1 probe for iAMP21 detection seems to be necessary for childhood BCP-ALL patients. LSI ETV6/RUNX1 ES Dual Color Probe revealed increased signals of RUNX1 (red). (A) An interphase cell and metaphase cell from case 6. The cluster of red signals indicates amplification of RUNX1 on the abnormal chromosome 21. (B) An interphase cell from case 10. (C) Metaphase FISH analysis from case 10 confirms that the clustered red signals are on one chromosome (arrow). The cumulative incidence of relapse by iAMP21. There was a trend toward a higher cumulative incidence of relapse in the iAMP21 group without statistical significance (P=0.102). (A) The event-free survival (EFS) and (B) overall survival (OS). Patients with iAMP21 were likely to have worse survival rates although there was no statistical significance. The intersection of survival curve of each group was observed at around 5 years after diagnosis in EFS and OS. Values are presented as median (range) or no. of patients (%). Abbreviations: BM, bone marrow; D7, seventh day of induction therapy; HR, high risk; NA, Not available; RER, rapid early response; SER, slow early response; SR, standard risk; VHR, very high risk. Clinical characteristics and cytogenetics of patients with iAMP21. Abbreviations: CNS, central nervous system; D7, seventh day of induction treatment; D14, fourteenth day of induction treatment; EOI, end of induction; HR, high risk; NA, not available; SR, standard risk; WBC, indicates white blood cell. Abbreviations: HR, high risk; RER, rapid early responder; SER, slow early responder; SR, standard risk; VHR, very high risk. Harewood, L, Robinson, H, Harris, R, et al. Amplification of AML1 on a duplicated chromosome 21 in acute lymphoblastic leukemia: a study of 20 cases. Leukemia, 2003;17;547-553. Soulier, J, Trakhtenbrot, L, Najfeld, V, et al. Amplification of band q22 of chromosome 21, including AML1, in older children with acute lymphoblastic leukemia: an emerging molecular cytogenetic subgroup. Leukemia, 2003;17;1679-1682. Harrison, CJ. Blood Spotlight on iAMP21 acute lymphoblastic leukemia (ALL), a high-risk pediatric disease. Blood, 2015;125;1383-1386. Harrison, CJ, Haas, O, Harbott, J, et al. Detection of prognostically relevant genetic abnormalities in childhood B-cell precursor acute lymphoblastic leukaemia: recommendations from the Biology and Diagnosis Committee of the International Berlin-Frankfürt-Münster study group. Br J Haematol, 2010;151;132-142. Moorman, AV, Robinson, H, Schwab, C, et al. Risk-directed treatment intensification significantly reduces the risk of relapse among children and adolescents with acute lymphoblastic leukemia and intrachromosomal amplification of chromosome 21: a comparison of the MRC ALL97/99 and UKALL2003 trials. J Clin Oncol, 2013;31;3389-3396. Heerema, NA, Carroll, AJ, Devidas, M, et al. Intrachromosomal amplification of chromosome 21 is associated with inferior outcomes in children with acute lymphoblastic leukemia treated in contemporary standard-risk children&apos;s oncology group studies: a report from the children&apos;s oncology group. J Clin Oncol, 2013;31;3397-3402. Moorman, AV, Richards, SM, Robinson, HM, et al. Prognosis of children with acute lymphoblastic leukemia (ALL) and intrachromosomal amplification of chromosome 21 (iAMP21). Blood, 2007;109;2327-2330. Robinson, HM, Harrison, CJ, Moorman, AV, Chudoba, I, Strefford, JC. Intrachromosomal amplification of chromosome 21 (iAMP21) may arise from a breakage-fusion-bridge cycle. Genes Chromosomes Cancer, 2007;46;318-326. Harrison, CJ, Moorman, AV, Schwab, C, et al. An international study of intrachromosomal amplification of chromosome 21 (iAMP21): cytogenetic characterization and outcome. Leukemia, 2014;28;1015-1021. Johnson, RC, Weinberg, OK, Cascio, MJ, et al. Cytogenetic variation of B-lymphoblastic leukemia with Intrachromosomal Amplification of Chromosome 21 (iAMP21): A multi-institutional series review. Am J Clin Pathol, 2015;144;103-112. Hunger, SP, Lu, X, Devidas, M, et al. Improved survival for children and adolescents with acute lymphoblastic leukemia between 1990 and 2005: a report from the children&apos;s oncology group. J Clin Oncol, 2012;30;1663-1669. Gaynon, PS, Angiolillo, AL, Carroll, WL, et al. Long-term results of the children&apos;s cancer group studies for childhood acute lymphoblastic leukemia 1983-2002: a Children&apos;s Oncology Group Report. Leukemia, 2010;24;285-297. Attarbaschi, A, Mann, G, Panzer-Grümayer, R, et al. Minimal residual disease values discriminate between low and high relapse risk in children with B-cell precursor acute lymphoblastic leukemia and an intrachromosomal amplification of chromosome 21: the Austrian and German acute lymphoblastic leukemia Berlin-Frankfurt-Munster (ALL-BFM) trials. J Clin Oncol, 2008;26;3046-3050. Attarbaschi, A, Panzer-Grümayer, R, Mann, G, et al. Minimal residual disease-based treatment is adequate for relapse-prone childhood acute lymphoblastic leukemia with an intrachromosomal amplification of chromosome 21: the experience of the ALL-BFM 2000 trial. Klin Padiatr, 2014;226;338-343.